The Umbro SX Boot, is the latest professional end football boot from the Manchester based boot manufacturer. A unique feature is that the left and right football boot is a different colour. The Umbro SX is being marketed with this message “Two Sides, One Goal”. The right boot is coloured red and silver, the left is black and silver. 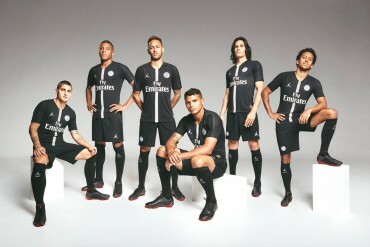 For me, this is going to look a bit odd on the football pitch, but still it’s a gimmick, isn’t it? The Umbro SX Boot is a fusion of two of their most successful boots. The SX Boot incorporates the comfort and simplicity of the classic, Speciali with the flare and technology of the Evolution X. Performance: Everything about the Umbro SX Boot is lightweight. The upper is lightweight Tejon microfibre, the heel counter is built from a lightweight TPU and Glass Fibre and it comes with a lightweight anatomical in sock. This all makes a for a very light football boot, that will not slow down your game. Power and touch is aided by teaming up with Michelin, yes Michelin the tyre manufacturers. They have helped create a layered application to the strike zone on the football boots. This microfibre suede system with a silicon print application has been developed to give extra feel on your touch. Comfort: The Umbro SX Boot is built with an upper made from lightweight Tejin microfibre that offers the wearer comfort and speed. The in sock, made from Poron, provides absorption on ground contact, where the major forces meet and stability is needed. The Umbro SX has a choice of two soleplates. The ”Fixed Metal” has 13 metal studs fixed, which are for good, firm and hard ground surfaces. The soft ground option is 6 screw in studs for use on soft natural surfaces. Verdict: Are we getting tired of the gimmicks being launched with each new football boot? No of course not, this is another quality high end football boot to mix it with the best. As the post says, gimmicky as hell. But I’m a sucker for gimmicks and I find it exciting how more and more companies are coming out with innovative football boots. £130 pounds is a bit steep though. Especially since I’m saving up for a pair of v-Konstrukt IIs! The v-Konstrukt II’ s are a great choice of football boot, I hope they serve you well! I have got the v-konstrukt I’s in blue and they’re the best. 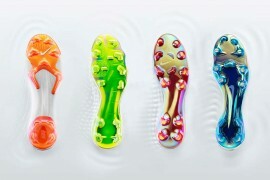 I cant wait to see these on the pitch! Any ideas who will be wearing them? Hey umbro X III are the best. Do you know how can i buy one pair of this rare umbro size 43eu?